The Canada portable fence is made of galvanized steel wire and square pipe. They are welded together and then powder coated or painted to form a durable structure. 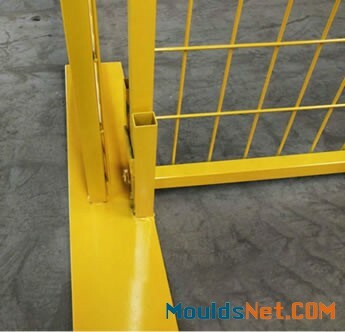 The fence panel is connected by the top coupler, metal feet and other accessories to become a whole portable fence system. The Canada portable fence is specially designed for strength and durability while also maintaining an original appearance though it is used for many times. The portable fence frame is made of steel square tubing with wire mesh welded on it. The feet is designed to support the panels a solid metal base plate with a square round locking system for a safety purpose. Finish treatment: PVC coated, painted. Color: commonly is green, orange, red. Other colors are available. Middle frame: square pipe. And it can be vertical and horizontal. Horizontal middle frame of the Canada portable fence. Vertical middle frame of the Canada portable fence. 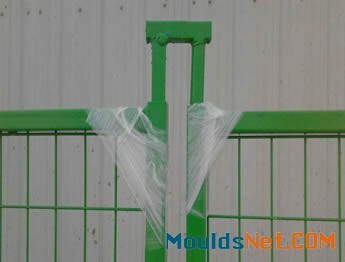 Portable fence top coupler is used for keep the neighbor panels together and make them stand well. It can supply a secure clamp to the fencing, hold secure under the tremendous pressure and withstand the harshest environments. The portable top coupler have two types: coupler with two round tubular legs and coupler with round and square tubular legs. The coupler with round and square tubular legs can fix one panel in place and the other rotate to any direction. It is ideal for the corner fence panels. Canada top coupler with round tubular legs. Canada top coupler with round tubular legs on the fence panel. Canada top coupler with round and square tubular legs. Canada top coupler with round and square tubular legs on the fence panel. Portable fence feet is the fixed form of the portable fence. It can keep the fence panel stand on the ground even in the harshest environments. 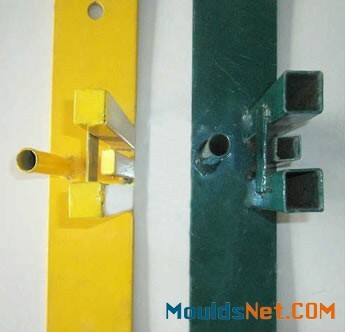 Portable fence feet can be divided into standard fence feet and anchor base feet. 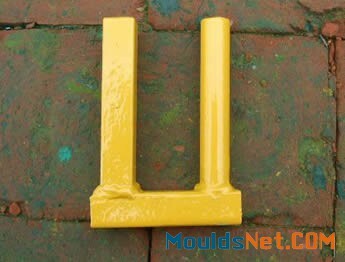 The anchor base feet are used to anchor to the hard surface wher the standard feet type are restricted. It can also used in the gate system as the gate base. The common sice is 860mm × 80mm × 6.0mm or 7.0mm (thickness). The finish treatment can be powder coated or painted. Standard portable fence feet on the fence panels. Anchor base portable fence feet. Anchor base portable fence feet on the fence panels. Security and safety. It can prevent theft and vandalism. The Canada portable fence are easy and fast to set up. The fence system are perfect for a variety of different applications. It can be used in the construction sites, housing construction. The Canada portable fence are frequently found in the cultural event, entertainment event and exhibitions. Canada portable fences can protect the machines from being stolen. Canada portable fence can assure the security of the factory.